Yes, that is a plate of tofu. It’s made of proteins – the same proteins that make you. You are literally a massive collection of proteins, they are the building blocks of every cell in your body. Proteins are created from the instructions found in DNA called genes. In total there are 23,000 genes in each cell which can generate over 100,000 proteins. A single gene can code for more than a single protein. When a gene codes for a protein, its called the Exom or the expressed DNA. 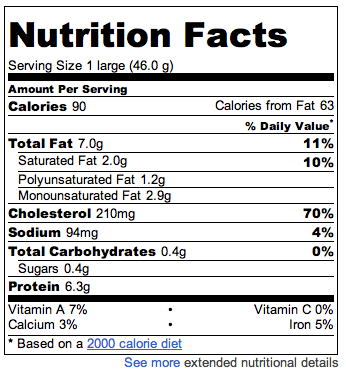 Have a look at a food label on a tofu package, it will list sugars, fat and protein. There are 6.3 grams of protein per serving in this example. This is the same protein your body’s cells create. When we eat protein (fish, eggs, tofu, milk), the body breaks the protein down into amino acids. It reassembles the amino acids back into a new proteins based your DNA. Muscle, skin, nerves, neurons, blood cells, bark, leaves, sap, slime, venom, scales, gills, and fur are all made from DNA organizing amino acids into proteins. If there is an error or mutation in your DNA, your proteins may not be made correctly. Knowing if there are errors can be quite useful as it is the cause of almost all genetic diseases. You hear of proteins all the time, but you probably didn’t realize it. Testosterone is a protein that acts as a hormone. Insulin is a protein used to regulate blood sugar. 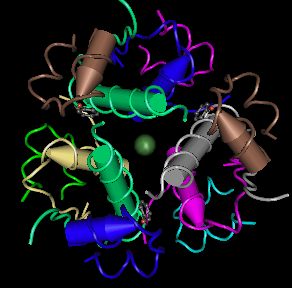 Hemoglobin is a protein that carries oxygen. The green dot in the centre, that’s the oxygen. A protein like the one of the right has secondary structures called alpha coils drawn as cylinders. Beta sheets, another common structure are often drawn as rows of arrows. Scientists use this type of diagram to understand the function of protein – three hemoglobin proteins are combining to create a hemoglobin molecule. In this video from Harvard, almost everything you see is a protein. Note the different shapes, sizes, and functions. Proteins are not static, they can bend, change shape and walk – yes, literally walk. What you see here is happening in the 100 trillion cells which make up you. Here is the same video, but this time the proteins are labelled and more detailed. It’s over twice a long and its remarkable all the different proteins required to make a cell function. Keep in mind that every protein is created from DNA and proteins combine to create bigger structures. Technically speaking, this is how it DNA to Protein works: In your DNA a sequence of DNA makes a gene which codes for a protein. A gene consists of many 3 DNA letter groups called codons. Each codon corresponds to an amino acid. As the cell reads the DNA, it assembles the amino acids into a long chain which then folds into a protein. This entire process known as the Central Dogma of Biology – it is extremely fast and accurate. One of the hardest questions in biology is the structure of proteins. The amino acid chain folds into a complex 3D structure. You would think figuring out that structure would a simple task, but its one of the hardest problems in science. The most powerful computers in the world, like Blue Gene, are working on the challenge. As you can imagine, mutations in your DNA can lead improper proteins. Which is why getting SNP’d is a good idea – its lets you check for common mutations that lead to sub-optimal protein structure.